Contribute to a more sustainable environment by diverting waste from landfills by implementing a recycling program with recycling solutions from Rubbermaid that are designed for paper, plastic, glass & more. These recycling solutions are available for public areas; both indoor and out, as well as back-of-house applications – the right container for every recycling need. Visibility: Easily recognizable containers with the universal recycling symbol clearly shown. Sustainable: Most resin-based products meet or exceed EPA guidelines for Post-Consumer Recycled Resin (PCR). Metal-based products contain a minimum 30% post-consumer recycled steel or 70% post-consumer recycled aluminum which exceeds EPA guidelines. All Rubbermaid plastic and metal containers are 100% recyclable. 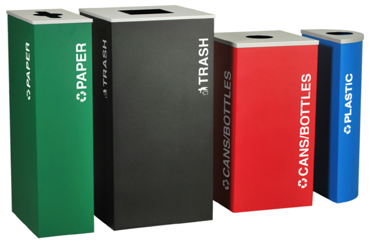 Variety: Different sizes, types & colors of recycling containers available for every recycling need to create a successful recycling program. Accessories: Choose the design that best meets your requirements. A wide variety of lids with shapes that indicate the type of waste that should be placed in the container. Dollies with casters effortlessly move recycling containers when portability is needed. The Configure™ decorative refuse containers provide a customizable recycling solution with sleek, smooth surfaces and contoured edges. 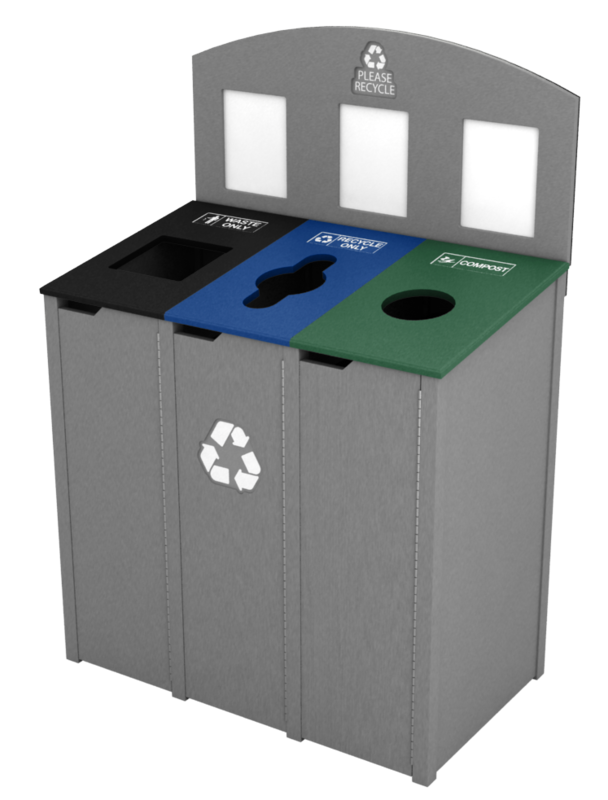 This recycling system has a modern appearance that will fit seamlessly into any indoor or outdoor commercial environment. The Configure system can be tailored to the specific needs of the commercial environment. There are a variety of sizes available, 15G, 23G, 33G and 45G. Nex-Terra waste & recycling station’s excel at meeting unique aesthetic requirements while maintaining the balance of branding, messaging, and recycling success. Select from our six signature collections and custom configure a solution for every area of your facility. 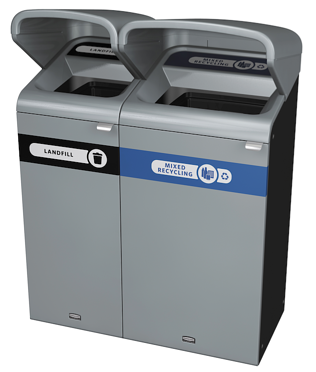 Empower users to take recycling into their own hands - Cut down on collection points and eliminate unnecessary custodial stops with a custom configured centralized waste & recycling station. 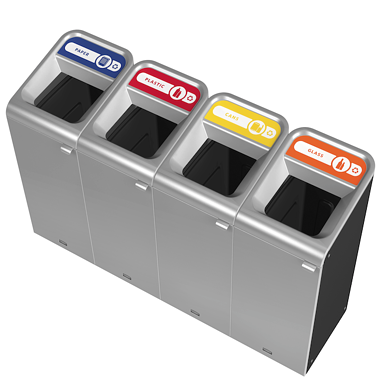 Split color waste streams and restrictive openings allow users to easily identify the appropriate collection point, while promoting a streamlined trash collection and decreased contamination. Our four roof style options allow facilities to match their indoor and outdoor waste & recycling. The curved roof option reduces water and snow buildup and prevents users from putting items on top of the bin. Made from our signature Nex-Terra Material, our roofs are never bent or cut to allow for maximum strength and longevity. View the Nex-Terra brochure here. At Ex-Cell Kaiser, we’re committed to protecting the environment and natural resources. That’s why we’ve teamed up with the U.S. Green Building Council to leverage the personnel, knowledge and physical tools needed to positively impact environmental sustainability. Each and every day, we’re looking for new ways to leave a positive environmental footprint, whether through our own day to day business operations or through our products and manufacturing process. Our internal efforts include the implementation of company and plant wide recycling procedures and initiatives, the separation of recyclable waste, timed production processes to reduce energy consumption and the purchase and usage of green cleaning products and products made of recycled waste.